[104 Pages Report] The global wearable injectors market is projected to reach USD 9.41 billion by 2023 from USD 5.44 billion in 2017, at a CAGR of 11.1% during the forecast period. The base year considered for the report is 2017 and the forecast period is 2018–2023. 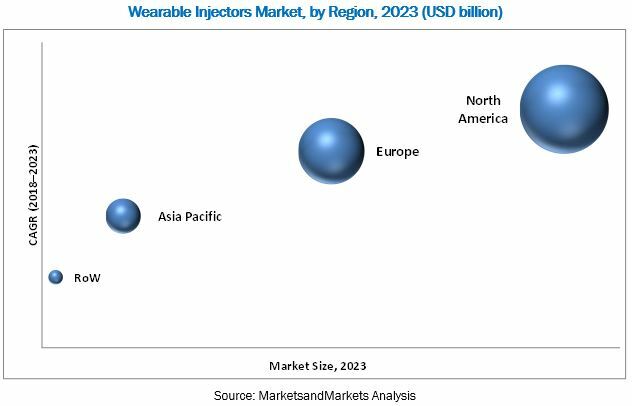 Top-down and bottom-up approaches were used to validate the size of the global wearable injectors market and estimate the size of other dependent submarkets. Various secondary sources such as International Association of Cancer Registries (IACR), International Society of Geriatric Oncology (SIOG), International Society of Paediatric Oncology (SIOP), International Agency for Research on Cancer (IARC), International Diabetes Federation (IDF), International Council of Cardiovascular Prevention and Rehabilitation (ICCPR), American Association for Cancer Research (AACR), American Society of Hematology, American Diabetes Association, American Association of Diabetes Educators (AADE), American Heart Association, European Society for Medical Oncology (ESMO), European Association for Cancer Research (EACR), European Cancer Organization (ECCO), European Association for the Study of Diabetes (EASD), European Society of Endocrinology, European Society of Cardiology, European Parkinson's Disease Association (EPDA), Asian Clinical Oncology Society (ACOS), Asian Cancer Foundation, Asian Association for the Study of Diabetes (AASD), ASEAN Federation of Endocrine Societies, Asian Pacific Society of Cardiology, Cancer Foundation of China (CFC), Japan Endocrine Society, Brazilian Society of Endocrinology and Metabolism (SBEM), Brazilian Diabetes Association (ADJ), Latin American Diabetes Association (ALAD), press releases, and annual reports of the companies have been used to identify and collect information useful for the study of this market. The major players in the global wearable injectors market are Amgen (US), Medtronic (Ireland), Insulet Corporation (US), Tandem Diabetes Care (US), United Therapeutic Corporation (US), Valeritas (US), and SteadyMed Therapeutics (US). The other prominent players in this market are Ypsomed (Switzerland), Becton Dickinson and Company (US), Enable Injections (US), Sensile Medicals (Switzerland), and Bespak (UK). The global wearable injectors market is projected to reach USD 9.41 billion by 2023 from USD 5.57 billion in 2018, at a CAGR of 11.1% during the forecast period. 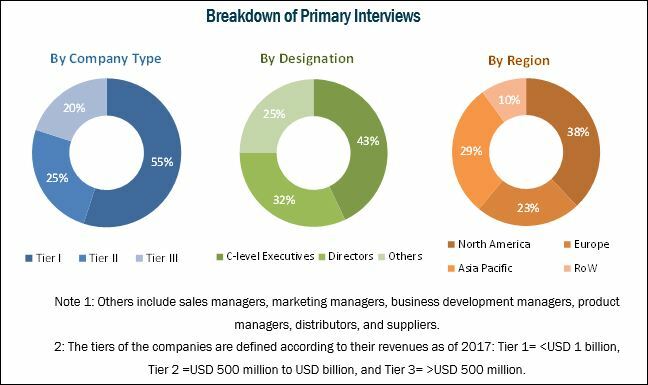 The growth of this market is primarily driven by the growing prevalence of chronic diseases (such as cancer, diabetes, and CVD); favorable reimbursement scenario in major markets; and technological advancements in injector devices. However, the preference for alternative drug delivery modes and a poor reimbursement structure in developing countries is expected to limit the adoption of wearable injector devices to a certain extent. The market is segmented on the basis of type, therapy, and region. Based on type, the market is segmented into on-body and off-body injectors. The on-body wearable injectors segment is expected to account for the larger market share in 2018, while the off-body injectors segment is projected to witness the highest growth rate during the forecast period. The drawbacks associated with on-body wearable injectors, such as painful removal, skin sensitivity issues and irritation, and adhesive fitting issues have resulted in the increased adoption of off-body injectors. Based on therapy, the global wearable injectors market is segmented into immune-oncology, diabetes, cardiovascular diseases, and other therapies (such as Parkinson’s disease, thalassemia, and primary immunodeficiency disease). The immuno-oncology segment is expected to account for the largest share of the market in 2018. The large share of this segment can be attributed to the high prevalence of cancer across the globe. By region, the global market is segmented into North America, Europe, Asia Pacific, and the RoW. The North American region is expected to account for the largest market share in 2018. The large share of this region can be attributed to the rising prevalence of chronic diseases such as cancer, diabetes, and cardiovascular diseases and favorable reimbursement scenario in this region. The global wearable injectors market is dominated by Amgen (US), Medtronic (Ireland), Insulet Corporation (US), Tandem Diabetes Care (US), United Therapeutic Corporation (US), and Valeritas (US). These players adopted growth strategies such as product launches, product approvals, agreements, and expansions to maintain and enhance their positions in the market. Other prominent players in the market include Ypsomed (Switzerland), Becton, Dickinson and Company (US), SteadyMed Therapeutics (US), Enable Injections (US), Sensile Medicals (Switzerland), and Bespak (UK). 10.6 Tandem Diabetes Care, Inc.